Rose Queen Ann’s Lace We LOVE combining beautiful faux flowers and plants, and boy, have we come up with a winner here. This stunning offering consists of a single large Rose bloom that sits front and center, surrounded by billowy white Queen Ann’s Lace that perfectly complements the Rose’s elegance. Truly, it’s a match made in Heaven (and here as well!) 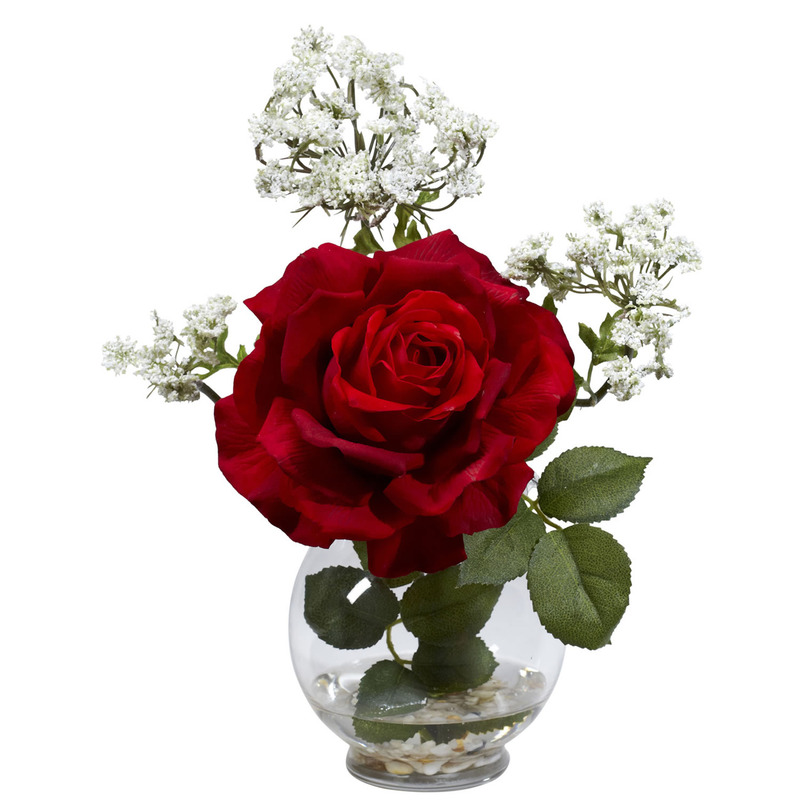 Comes in an elegant glass vase w/ faux water to provide a lifetime of beauty. Specifications: Height: 13 in Width: 9 in Depth: 7 in Vase: W: 4.5 in, H: 5 in Shipping: We ship using UPS Ground, USPS, OR FEDEX. Please use the shipping calculator for your shipping costs. International customers must email julieannsboutique@gmail.com for shipping quotes. Shipping costs can be substantially higher. We do offer an alternative option. International customers may obtain a United States shipping address through a shipping forwarder that we have partnered with. This may save you money on the cost of shipping. If you are interested please contact us for instructions on how to sign up. Return policy: We accept returns for unused products with tags/labels intact in BRAND NEW CONDITION. Buyers must request for an RMA number and return instructions within 48 hours of receiving the product. Returns without an RMA number will not be accepted. All returns are subject to a refund minus 20% restocking fee and shipping cost.